We’ve seen majestic waterfalls, eaten crescent-shaped meat pies called pasties (pass-tee), camped in rain coming down so hard that we considered digging a moat around the Fireball, and now we’re freezing our asses off! What gives? It’s the UP! 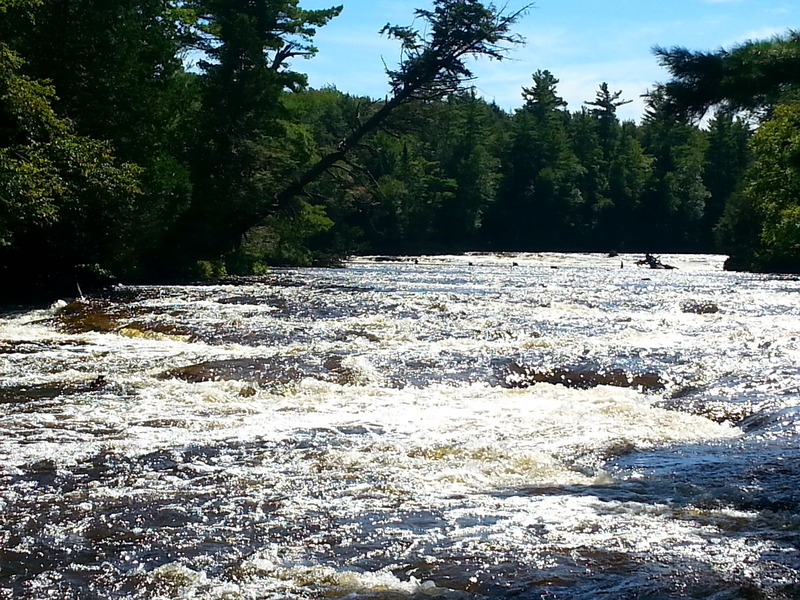 We arrived at Tahquamenon Falls State Park in Paradise (who could not love this place?) on Monday. Scored a choice spot in one of the two campgrounds near the Lower Falls. We picked the less-crowded of the two campgrounds, and were rewarded no neighbors, no nearby kids,and a large shady site. 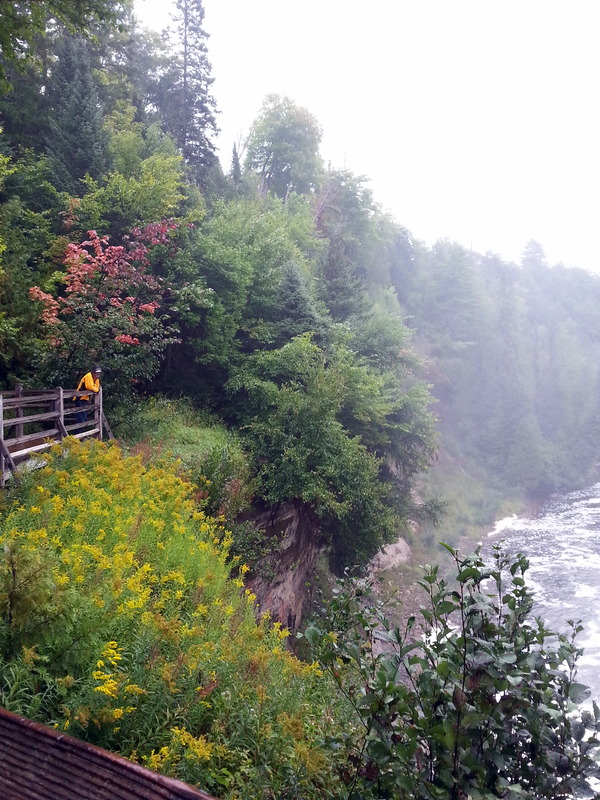 First order of business was to explore the Lower Falls, accessible by a one-mile trail from the campground. 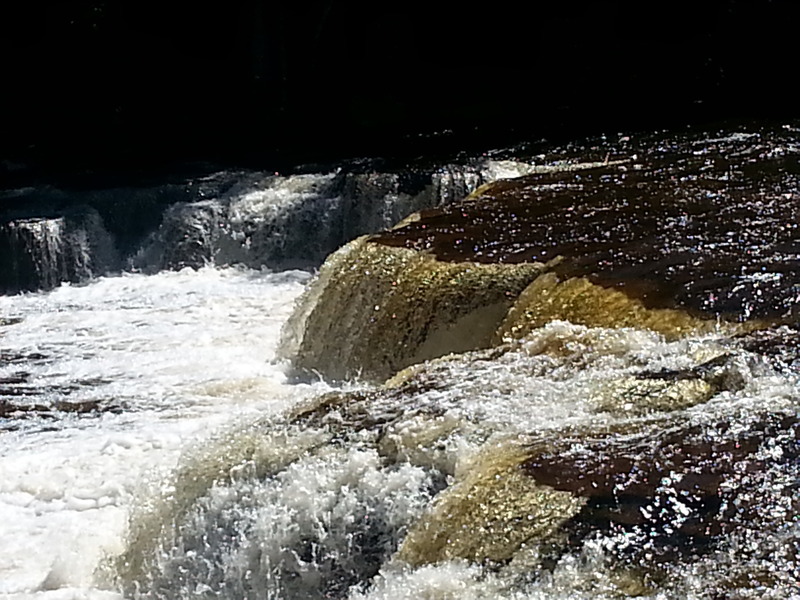 Right away, we notice the brown color of the falls, and think yuck! But, it’s actually the result of the tannins leached from the cedar swamps the river drains. These same tannins were used years ago in the leather tanning process. Cedar bark was shipped across Lake Superior to tanneries in Sault Ste Marie back in the early 1900s. The Lower Falls are actually five separate falls. One way to see them all up close and personal is to rent a boat, row 300′ across the river to a small island, and explore on foot. Wisely, we elected to just see the Falls from our viewpoint along the Trail. Tuesday was bright and sunny, so we decided to pedal the 45-mile round trip to Whitefish Point on our mountain bikes. The flat route made pedaling our heavy (well….heavier) mountain bikes pretty easy. 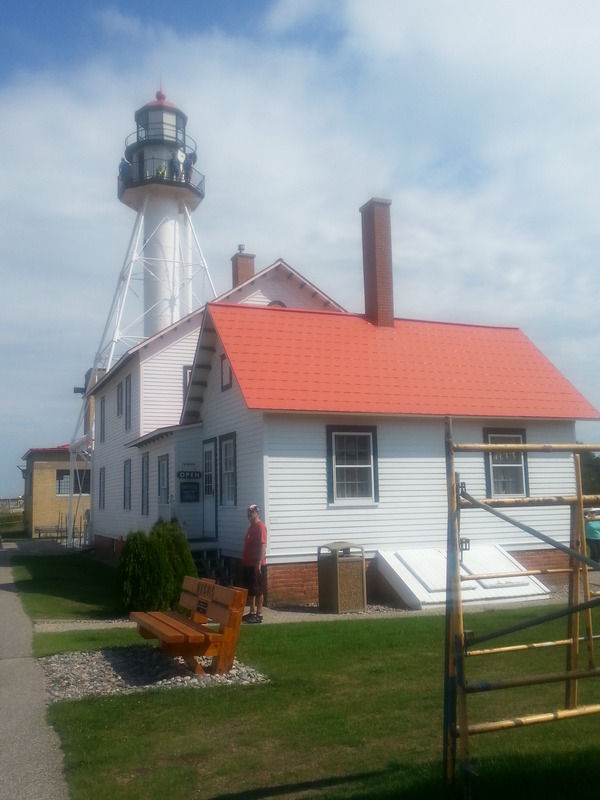 Whitefish Point is the northwestern point of Whitefish Bay, and is the home of the Great Lakes Shipwreck Museum. It’s also the oldest continuously operating lighthouse on Lake Superior. The current structure was built in 1861. There are so many shipwrecks in Lake Superior that it’s amazing a person just can’t walk across the Lake atop the wrecks. Of course, the most famous of these wrecks is the Edmund Fitzgerald, sunk in November 1975, and made famous in the song by Gordon Lightfoot. 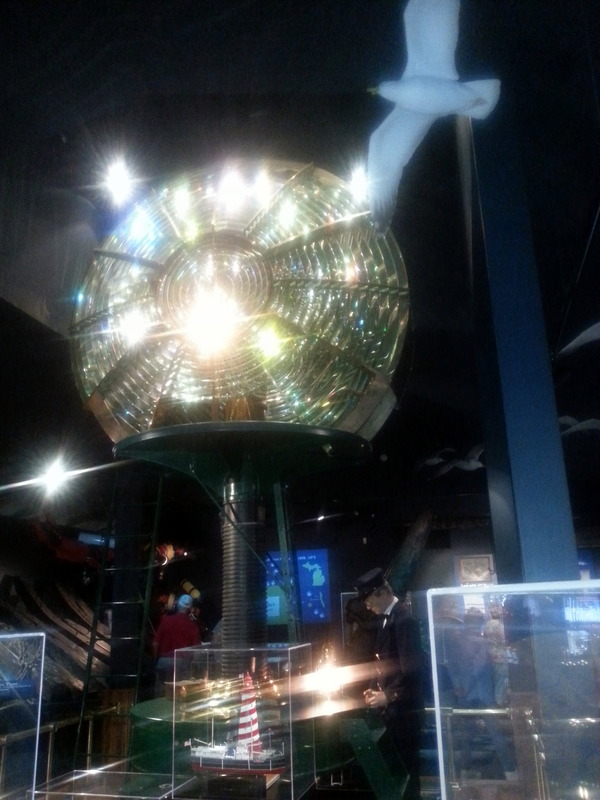 Front and center in the museum is a Second-Order Fresnel Lens from a nearby lighthouse. Nine feet in diameter, the 3500 pound lens floats on a liquid mercury bearing, allowing for nearly frictionless rotation. Every two hours, the lighthouse keeper would wind up the mechanism, similar to a grandfather clock, regulated by a 44-foot pendulum. Each lighthouse along the shoreline had its own distinctive light pattern – this one had a 7.5 second pause between beams. Another part of the Museum are dedicated to the Lifesaving Services placed every 10 miles along the Superior coast. A terrific docent brought these treacherous operations to life for us, detailing the use of various boats, containers, and baskets used in rescue missions. My photos of this section all sucked, so you’ll have to just imagine how interesting this was! The home life of the lighthouse keeper’s family in the 1950s was also a highlight. 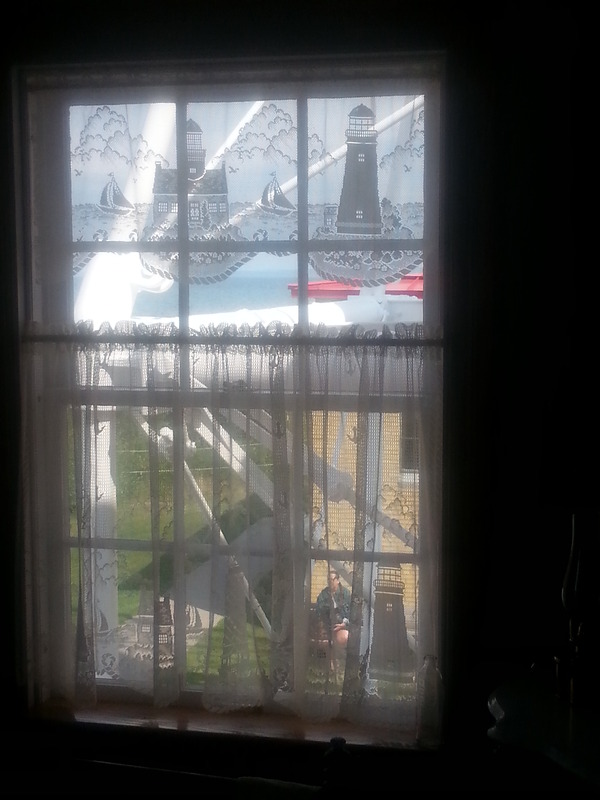 I was charmed by the tatted curtains in all the windows. But, into every life a little rain must fall. Or, a lot of rain. We knew it was coming. In a light drizzle, we decided to drive to the Upper Falls on Wednesday. We wanted to be able to check out the brewpub (Yea! A brewpub located in a State Park!!) 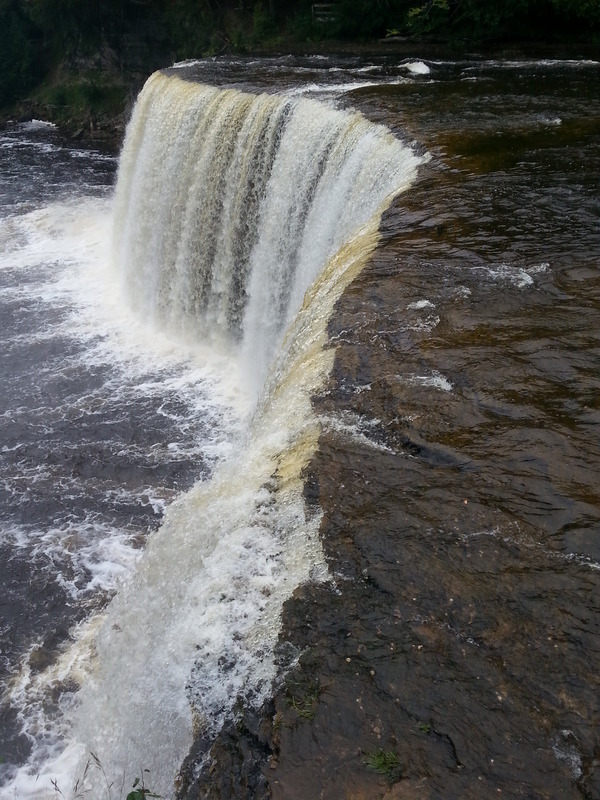 at the Upper Falls, and be able to get back if the weather worsened. 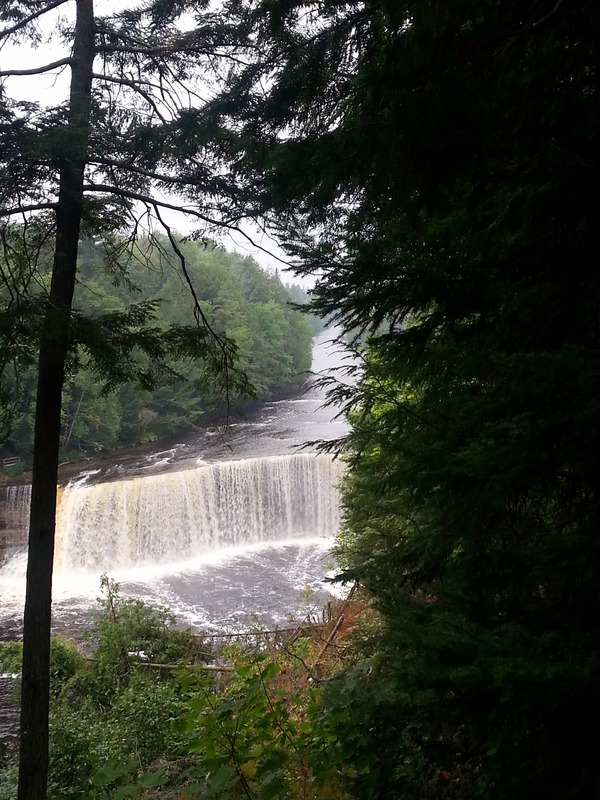 The Upper Falls are higher, and gorgeous. We hiked up and down a couple hundred steps to see them from all vantage points. 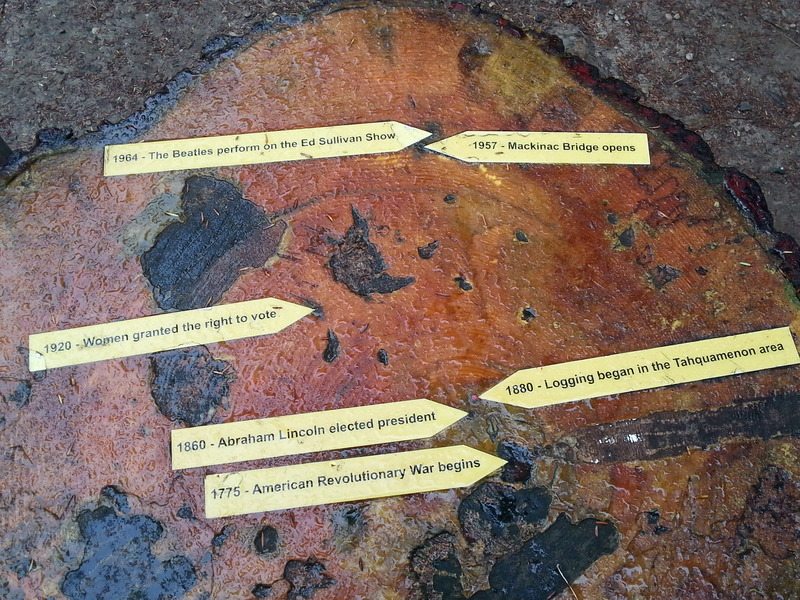 We liked a cedar stump dated at the center by the beginning of the Revolutionary War in 1775. The last notation was “The Beatles appeared on the Ed Sullivan Show”. By the time we left the pub, it was raining in earnest. 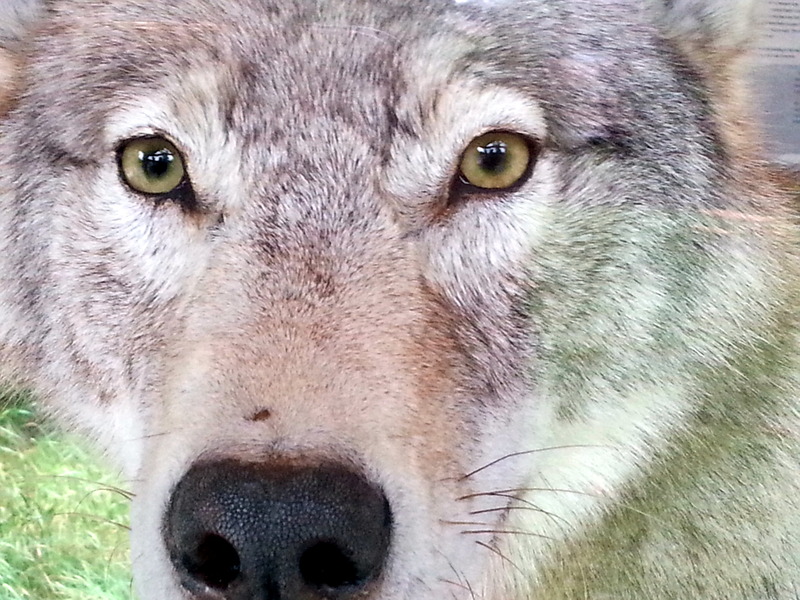 Under the watchful eye of the local gray wolf, we carefully drove back to camp, and prepared to cocoon for the rest of the day. Absolutely torrential rains commenced for the next 14 hours! Our beautiful site turned into a low, muddy mess, with the mud sluicing down onto our outdoor mat. We may never get it clean! But hey! It stopped by morning, and we prepared to break camp and head for Grand Marais. The temperature dropped into the 40s and night, and it was a cold, gray morning putting away soggy, filthy gear. 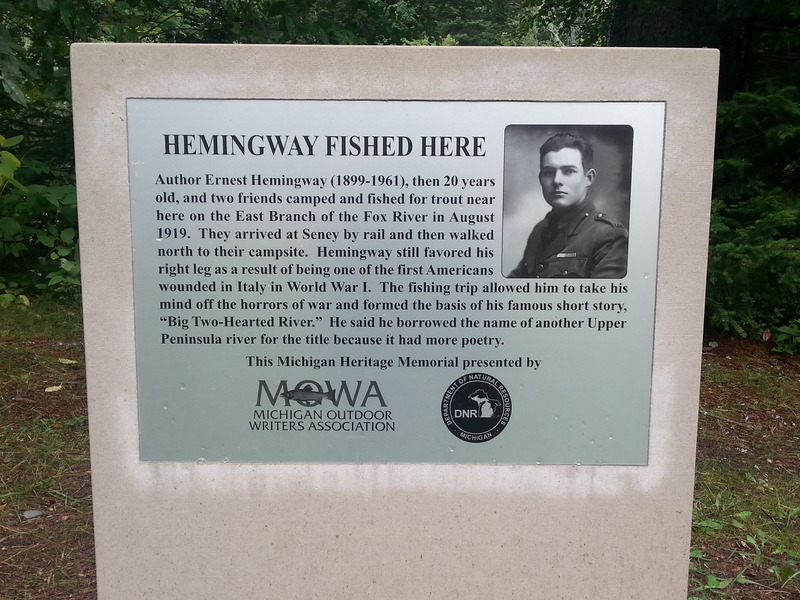 Along the way, we stopped to investigate the Fox River State Forest Campground, and found a plaque dedicated to Ernest Hemingway. There’s also a natural spring here which runs continuously. Curious. 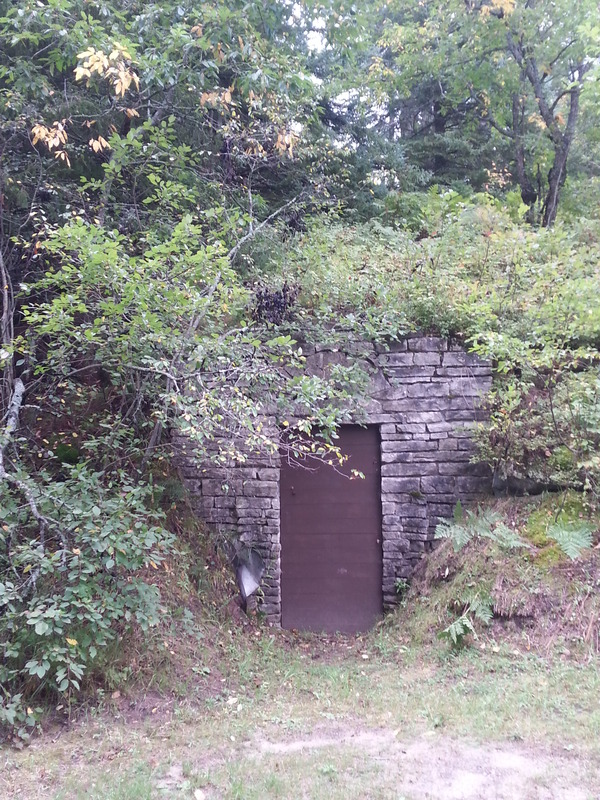 And most unusual, what appears to be some kind of tunnel…. There were some fabulous campsites at this little spot, and we hope to get back here some day. 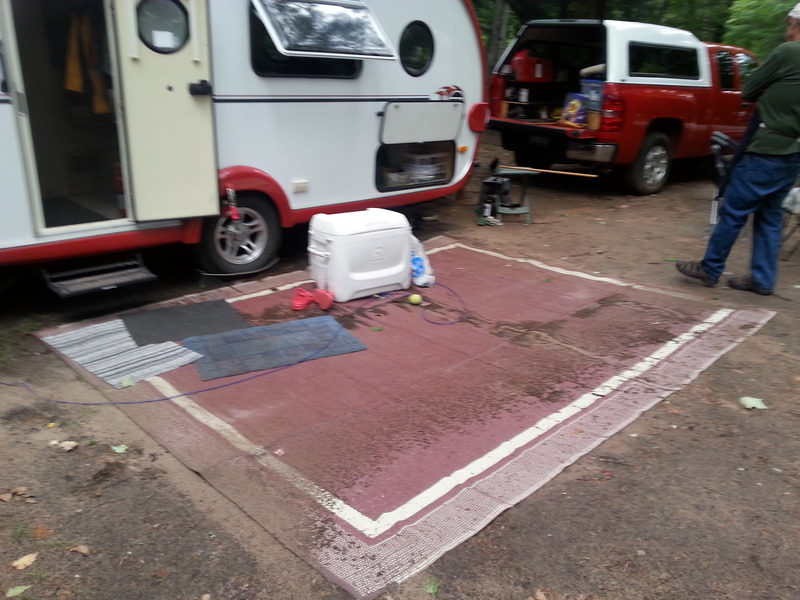 It’s finally time to do a bit of laundry, so we check into the township campground in Grand Marais. Hot showers! Laundry facilities! Around the corner from Lake Superior Brewing! We’ll resupply and head out into rustic camping again tomorrow morning. 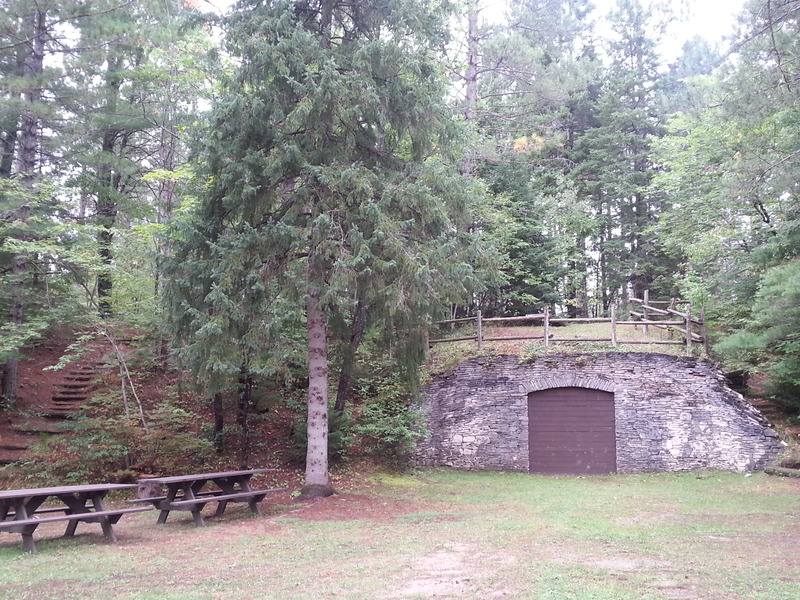 Our plan is to head to the Lower Hurricane River Campground in Pictured Rocks National Lakeshore. We got a tip that Site #5 was the one to get, so we’re on a mission. It’s pretty cold here, and we’re hoping that it will reduce competition for these rustic spots. 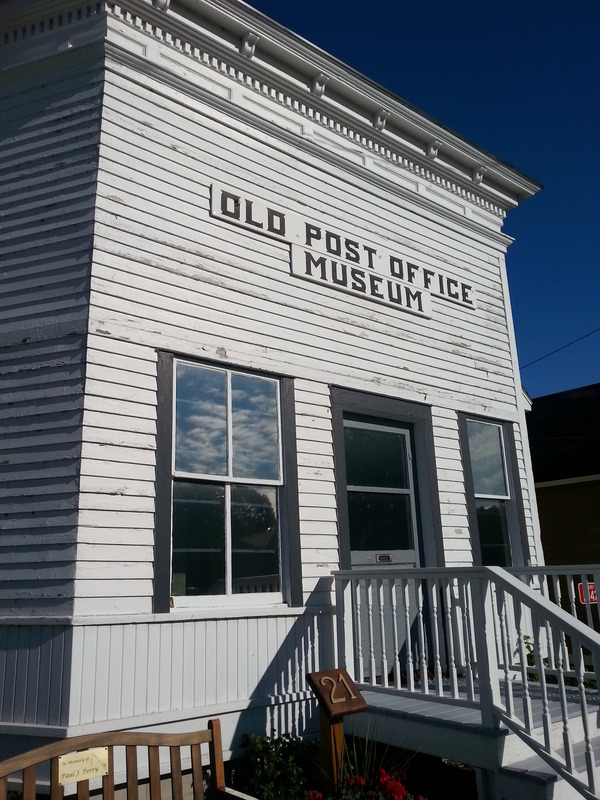 Here are a few shots of lovely Grand Marais. Agates found in the area have been sliced, polished, and incorporated into ‘stained glass’ type of panels. They were fantastic! 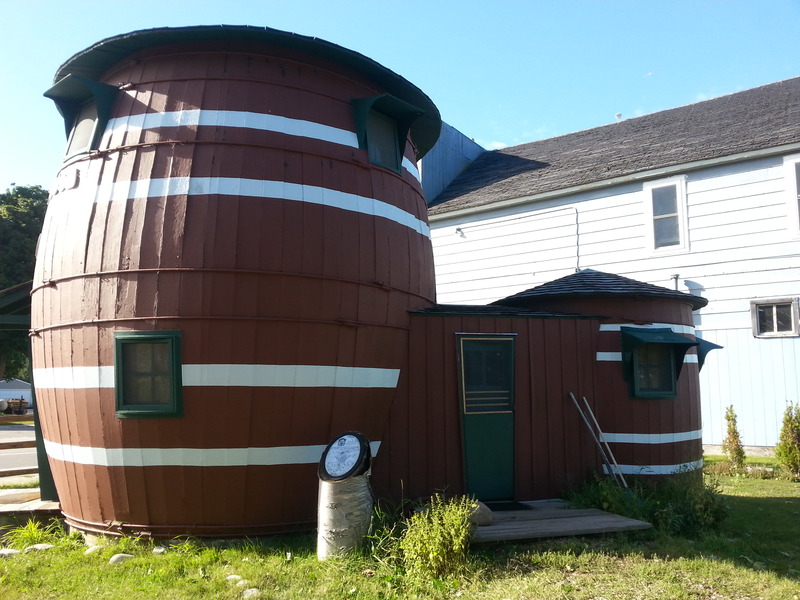 The Pickel Barrel House was actually a summer cottage from 1926-1937. It’s on the National Register of Historic Places. This entry was posted in camping, Michigan, national parks, retirement, state parks, T@DA, weather by Judy Crankshaw. Bookmark the permalink. Keep it up, wish I could be there. Wish you could be here too, Jochen. This is right up your alley! Thanks for taking us back to the UP! We loved the falls, Pictured Rocks, and the Vierling Restaurant and Brewery in Marquette is on our “must return” list, as is the Brickside Brewery in Copper Harbor! I really enjoyed this post! 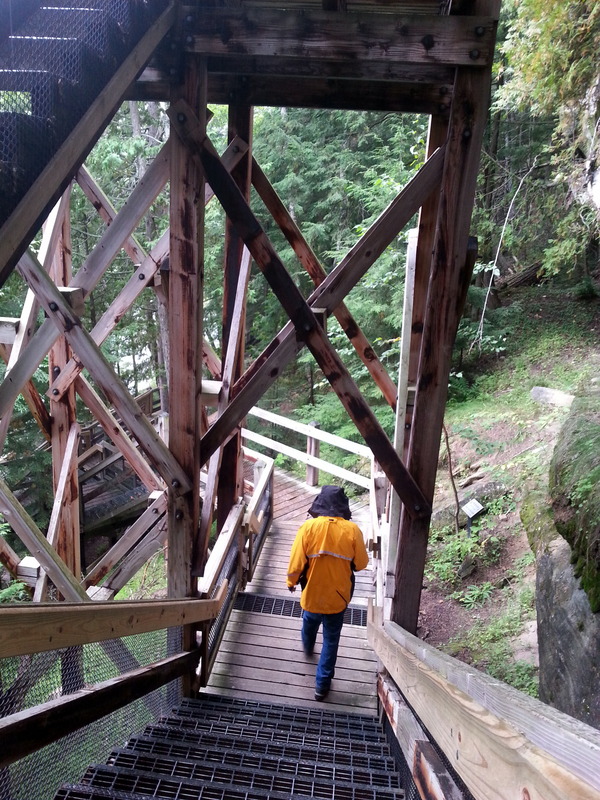 Lighthouses, weather, cold, falls, fresnal lenses on mercury bearings (which I never heard of before), an artesian spring, a mystery tunnel that looks like a weapons storage on a military base in a state park, history — it has it all! There is a lot to see here. We are happy to have the time to travel so slowly, so that we can take it all in. And to think that we didn’t even so to see the guy who has 30 black bears (just couldn’t get John to bite on that one!). Having made our share of stained glass….tickled to see the agates piece. 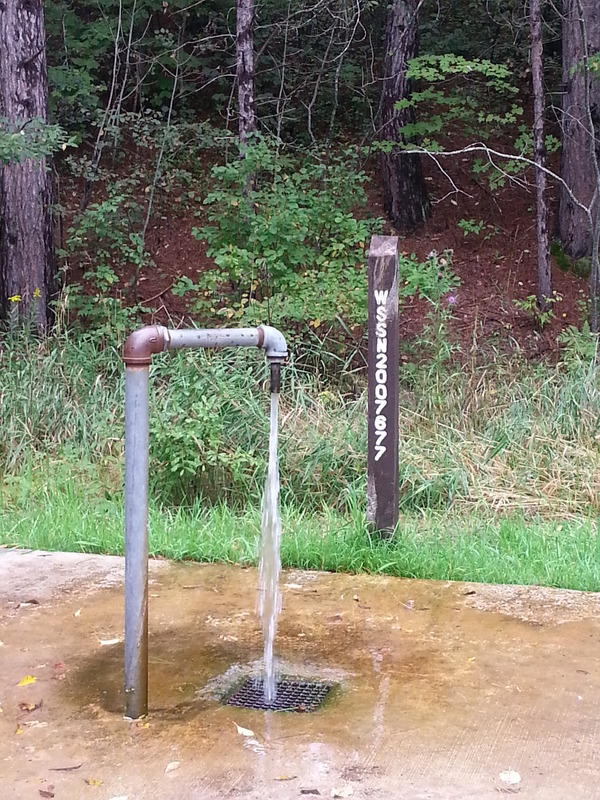 Brew at a state park…wow! Cool sights…. Even though it was only mediocre beer, it’s still a State Park brewery, so it counts! This is the life! Okay, the UP just went on the bucket list. 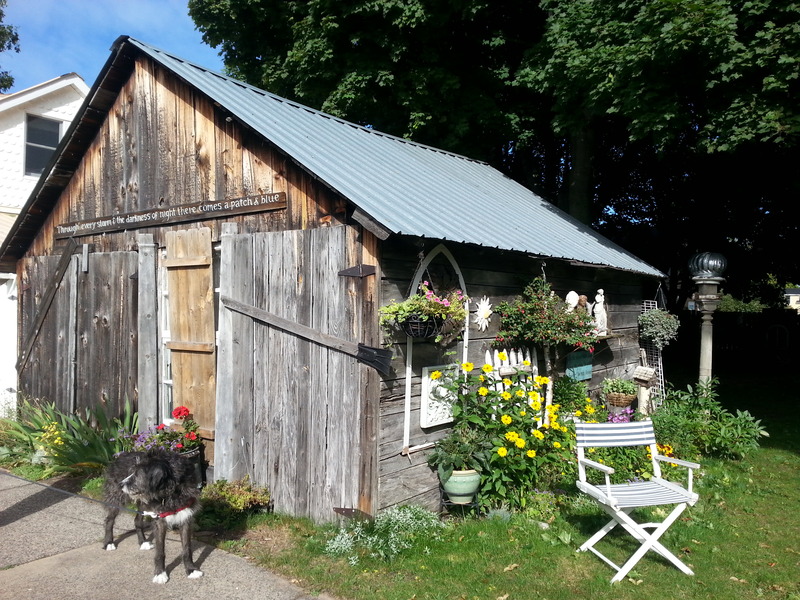 We are in NS – off to see Peggy’s Cove today. September is such a great time to tour, eh?! September is the month is really pays off to be old and retired. We’ve seen lots of folks in RVs, heading to Nova Scotia. It must be jammed! Hope your trip is going well. Look forward to swapping stories with you. Too bad that you are no longer in search of kitsch for your rolling home – this IS the 70 mile garage sale, right? We’ll roll together one of these days – I’m sure of that. Say hi to Cathie and Jay for us. Glad you stopped at Lake Superior Brewing. I think their whitefish is the best in the UP (when available). 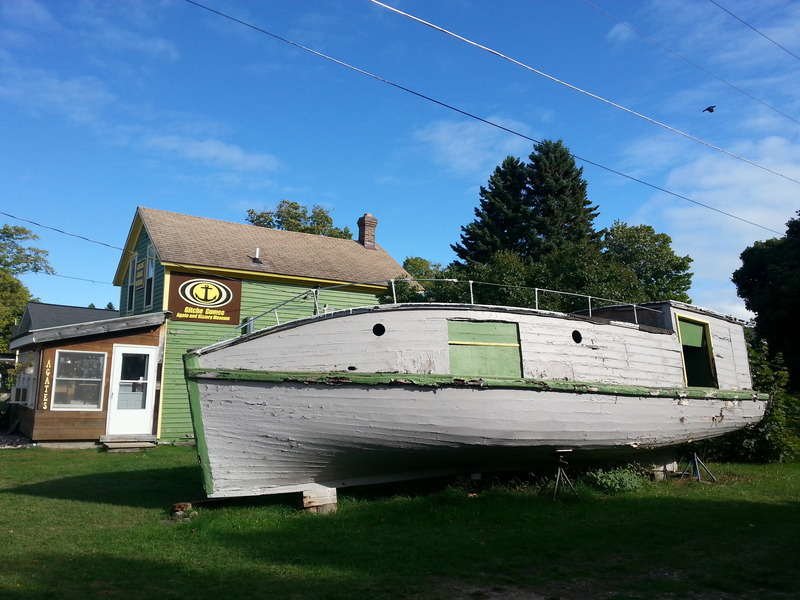 Grand Marais is a fun place – did you see the West Bay Diner? It’s an old diner car restaurant just around the corner from the harbor. It’s owned and operated by local author Ellen Airgood. Great shots of the TQ falls !!! I hope that the rain and wind lets up for the rest of your trip. The good thing about all the rain is that the waterfalls should be spectacular from the run off. I hear that there may be frost in the UP this weekend, that may do away with any skeeters. If you get a chance, and the weather cooperates, the Pictured Rocks boat tour out of Munising is well worth the time. We are going to be hanging around the area long enough that we should be able to get one of the Picture Rocks tours in. We’re also hoping to take the pontoon boat over to Grand Island and cycle around there for a day. We’re prepared for cold, but wet isn’t too much fun! Hoping to catch a bit of a break. Stunning beauty. Each picture opens another magical scene. The agate stained glass is amazing. Nature has such power and diversity. I haven’t been to Taquemenon Falls since I was in grade school. I still remember those sights. Thanks for the nostalgic mental trip. It’s amazing how much difference these 300 miles make. Saw one of those agate windows in a shop – I would love to make myself an early Christmas gift! Thanks. 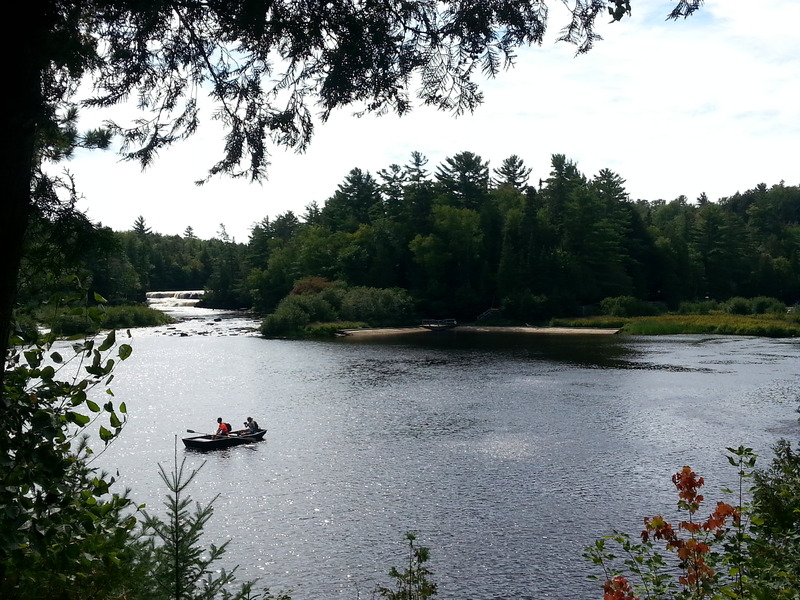 You have whet our appetite for the UP. Can’t wait to get retired and pursue our travel dreams. I think it will be even more gorgeous in the month to come. You and Sheila will love it up here!